Various kinds of evidence in this Breviary shows that it was made for Coldingham Priory, about 10 miles north of Berwick-on-Tweed, in Scotland, perhaps at Durham: the abbey was a cell of Durham Cathedral Priory. The manuscript was certainly owned by a monk of Durham in the 16th century. 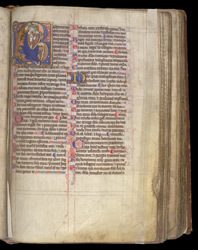 Following the Temporale, full-page miniature, Calendar, and computistical material, is the Psalter, starting on this page with a traditional image of King David Harping, in an initial 'B'.